The origin of the "so what chord" name would be due to its use by the jazz pianist Bill Evans in the modal tune "So what" by Miles Davis. This is a cool and modern sounding chord voicing often used as an alternative to quartal voicings. It is built with a fourth chord on the bottom (3 perfect fourths stacked) and a major third added on the top. This particular chord was originally played on a piano, but it is quite interesting to play it on the guitar to support rhythmically and harmonically a soloist over a modal tune. 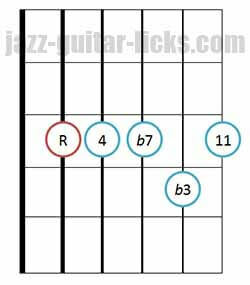 This jazz guitar rhythm lesson with tabs and diagrams provides you some interesting ideas of comping inspired by McCoy Tyner's playing on "impressions" by John Coltrane. What is a "So what chord"
Before learning the "so what chord" it is better to know how fourth chords are built, so go take a look at this post about the quartal harmonization. The "So what chord" is a five note chord voicing coming from the Dorian mode. It is built with three perfect fourths and one major third. This creates a combination of quartal harmony (chords built in fourths) and tertiary harmony (chords built in thirds). 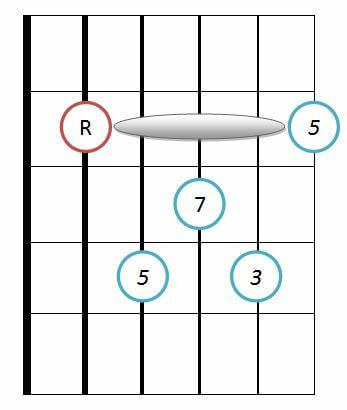 The example below show you how is built the Em11 chord. Starting from the degree I of the E Dorian mode, a first perfect fourth (A) is added to the root note (E), a second fourth (D) and a third fourth (G) are stacked. Thus giving a perfect fourth chord in its pure form (3 fourths are stacked). Now, just add the major third (B) starting from the higher note of the fourth chord and you get the "So what chord" named Em7add11. The "So what chord" is identical to the standard tuning of the five lowest strings of the guitar. (E-A-D-G-B). It is considered as m11 chord, but in theory m11 chords must contain a 9th. That is not the case here, so what chords are made up of 1, 4, b7, b3 and 11. You can even name them m7add11. For the 10 following exercises, we will use two "so what chords" and one major 7th chord built from the degrees I,II and III of the D Dorian scale. First, you have to know how the D Dorian mode is built. This is a minor mode, the second of the C major scale. In the Dorian mode the I and the II chords are minor chords. By stacking three fourths and adding a major third on each note related to the degrees I and II we obtain two "So what chords" (Dm11 and Em11). To play the Dm11 "so what chord" on the guitar using the guitar shape on the left, you have to put locate the root note "R" which is on the fifth string at the fifth fret. Em11 is located at the seventh fret, two semitones higher than Dm11. The guitar diagram on the left show you how to place your fingers to get a major 7th chord. It is not built in fourths, but in thirds. This is is an inverted drop 2 chord position. Put your first finger on the fifth string at the eighth fret and you get the root note of Fmaj7 used in the patterns below. 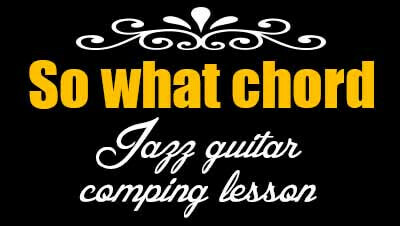 The 10 jazz guitar rhythm exercises below are arranged for guitar to practice modal chords inspired by Mc Coy Tyner's comping on "Impressions" by John Coltrane. First, be sure to master the two previous chord shapes before learning these 10 rhythm patterns. Once you have learned all these patterns you have to transpose them a semitone up, from Dm7 to Ebm7 and try to fit them with the backing track which is 16 bars of Dm7, 8 bars of Ebm7, 8 bars of Dm7. You can play with your thumb, as it is shown in the video, or you can use a pick. Which makes a total of 6 chords to play : Dm11, Em11, Fmaj7 (D Dorian mode) and Ebm11, Fm11 Gbmaj7 ( Eb Dorian).